1. Apply Painterly all over the lid as a base. You can either use your fingers or a flat synthetic brush (e.g. MAC 242). 2. Sweep Cork into the crease using a windshield wiper motion (e.g. MAC 217). I like to use a neutral brown eyeshadow in the crease when creating a very colourful eyeshadow look as it helps to ‘ground’ the look. The brown also adds a little definition and shape to the eye. 3. Take a pointed pencil brush (e.g. pointed end of Bare Minerals Precision Eye Brush; MAC 219) and apply Sketch to the outer v.
4. Take a flat shader brush (e.g. MAC 239) and pat Gossip on the outer lid. 5. Take a flat shader brush (e.g. MAC 239) and pat Seize on to the middle lid. Overlap this very slightly with where it meets Gossip to help the shades blend together. Don’t take it too far into Gossip, as you want to keep the intensity of both shades. 6. Take a flat shader brush (e.g. MAC 239) and pat Calavera on to the inner lid. Overlap this very slightly with where it meets Seize to help the shades blend together. Don’t take it too far into Seize, as you want to keep the intensity of both shades. 7. Using a crease/blender brush (e.g. MAC 217) or a pointed crease brush (e.g. MAC 226), sweep Blanc Type on to the browbone to highlight and blend out the edges of the crease colour. Using a matte highlighter shade helps to ‘clean up’ and freshen the eye when using such bold shades on the lid. 8. Take an angled eyeliner brush (e.g. Sonia Kashuk Bent Liner Brush) and apply a very thin line of black gel liner along the upper lashline. Very lightly dot any black gel liner remaining on the brush along the lower lashline. This will give a little more definition to the lower lashline, especially nice when using such bold shades on the lid. 9. Take an eyeliner brush (e.g. MAC 266) and apply Sketch to the very outer lower lashline and overlap it with Gossip on the outer lower lashline. Take the same brush and apply Seize on the the middle lower lashline and Calavera on the inner lower lashline. 10. Apply plenty of black mascara to the top and bottom lashes. 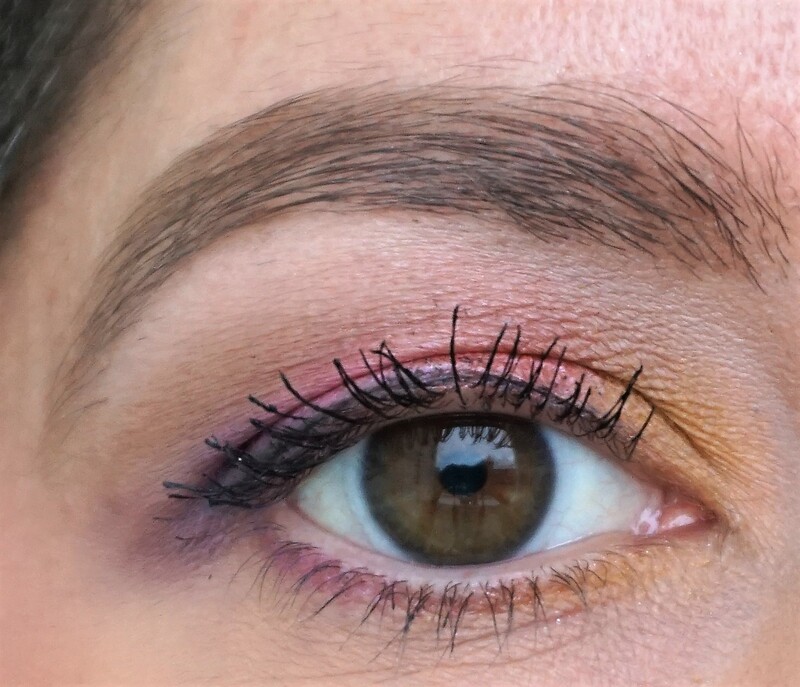 Black mascara really helps to frame the eye when using such colourful eyeshadows. 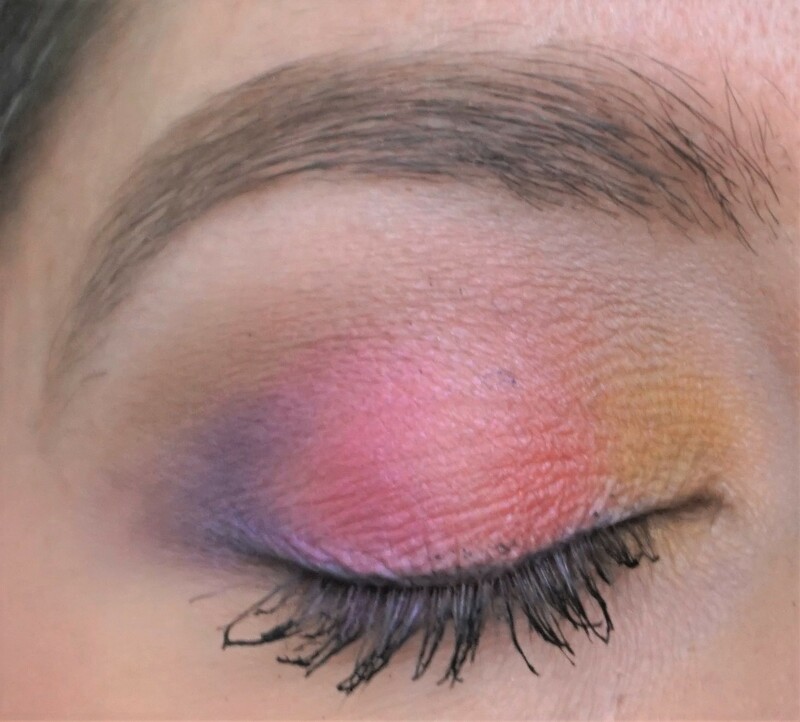 Unsure what else to wear on the face when wearing such a bold eyeshadow look? I kept the cheeks quite natural so that they wouldn’t clash with the eyes. I used MAC Melba blusher (matte peach) on the cheeks and Laura Gellar Baked Brule Dulce De Leche Highlighter (light shimmery beige-gold) as my cheek highlighter to add some luminosity. I like wearing peachy, warm nudes on the lips when using bold eyeshadows. I used Bare Minerals Make Your Move Lipstick on the lips and topped it with MAC Nymphette lipglass for a little extra shine.